Shredded Steak Taquitos with Jalapeno Lime Crema - Crispy corn tortillas filled with spicy shredded steak and topped with Jalapeno Lime Crema. The perfect way to celebrate your Cinco de Mayo! Cinco de Mayo is right around the corner and you all know that is a big deal in with me. Growing up in Southern California, it was a holiday that we ALL celebrated. Good food, and lots of it, was always consumed no matter where I was. So lately my house has been full of Mexican inspired dishes. I love coming up with new recipes for the blog PLUS we all know my obsession love of Mexican food is a year round thing. But that enthusiasm is not exactly shared with the man in my life, so Cinco de Mayo gives me the licence to go crazy with it, no matter what he thinks (that would be a big nanny nanny boo boo right in his face hehe). In just this past week I have made 3 different Mexican inspired recipes, with the most recent post combining them all for my Slow Cooker Kalua Pork Tacos. I have truly been in foodie heaven, creating and eating my way through so much new tasty food that I have barely had any time, or desire, to come up for air! But life must happen, and this past weekend was the perfect example of it. My son and his fiance had their baby shower, and it was a huge (and when I say huge I mean HUUUUUUUGE) affair. Like 50+ people were there! To say they made out like bandits is an understatement! I made nibbles for 100 guests, just to make sure there would be enough. By the time we got home from the party I was dead tired, and in no mood to cook anything. But my mind, and taste buds, are still in "Cinco de Mayo" mode, and all I was craving was Mexican food. No worries, it was José Olé to the rescue because I had several boxes of their yummilicious snacks in my freezer. I love keeping them on hand because they use quality ingredients ( a HUGE plus), are packed with protein (who doesn't need more protein? ), and are soooo easy to prepare (Even Kevin can do it!). It gives a girl a little reprieve from slaving away in the kitchen, and allows me to kick up my feet and relax all the while getting my cravings for tasty Mexican food satisfied. If you have been reading my blog for a while I am sure you have heard me mention that the one Mexican meal that transports me back to being a teenager in San Diego is rolled tacos/taquitos. I can remember many a Cinco de Mayo enjoying a plateful of them crispy fried and smothered in sour cream, guacamole, and shredded cheese. OhhhEmmmmGeeee they were so good!! Now days I try to go a bit lighter, so I bake my taquitos instead of frying them. Then serve them on a bed of greens, topped with reduced fat cheese, chopped tomatoes, and this delicious Jalapeno Lime Crema that is made with fat-free Greek yogurt instead of sour cream. Sort of a rolled taco salad if you will! And it is AH-MAZING!! When I eat this I get flashbacks of being that teenager enjoying crunchy delicious rolled tacos at my fave little beach side Mexican joint. It almost makes me want to break out those old roller blades to head down the boardwalk with my friends. and I am not a teenager anymore. But for a bit, while enjoying these shredded steak taquitos, I feel like I am right back there again! Combine all of the ingredients in a food processor and process until well combined. Taste and adjust seasoning if needed. Cover and place in the refrigerator. Cook the taquitos per package instructions. 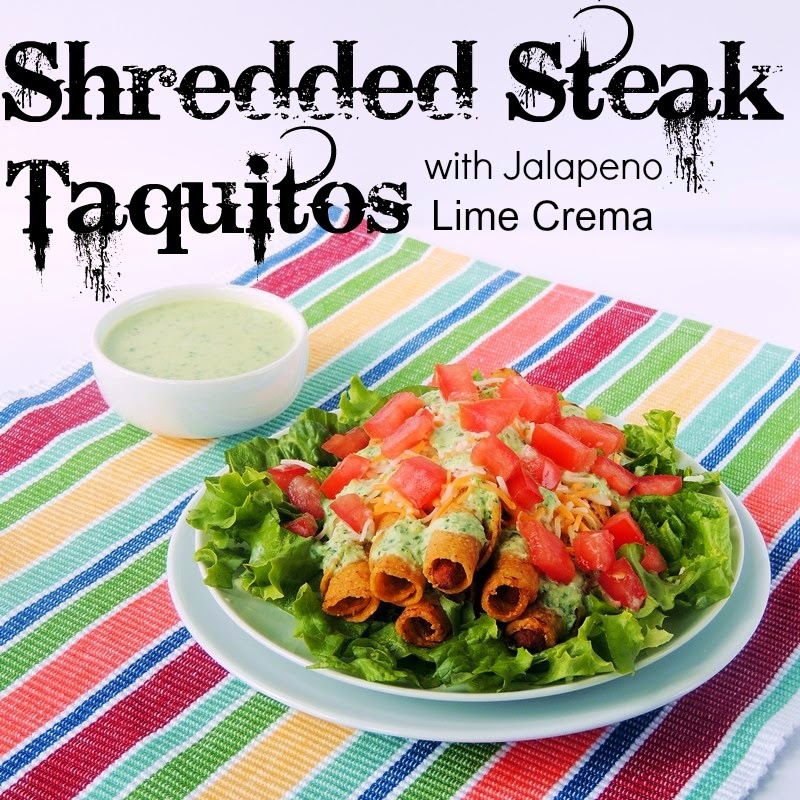 Place a handful lettuce on the plate, top with taquitos, shredded cheese, crema, and tomatoes. Are you ready to celebrate Cinco de Mayo? Make sure to grab a few boxes of José Olé during your next trip to the grocery store! You will be celebrating with your friends and family in no time, without having to spend a ton of time in your kitchen. I bought my José Olé Shredded Steak Taquitos, along with José Olé Beef & Cheese Mini Tacos and Chicken & Cheese Nacho Bites, at Hagen's. 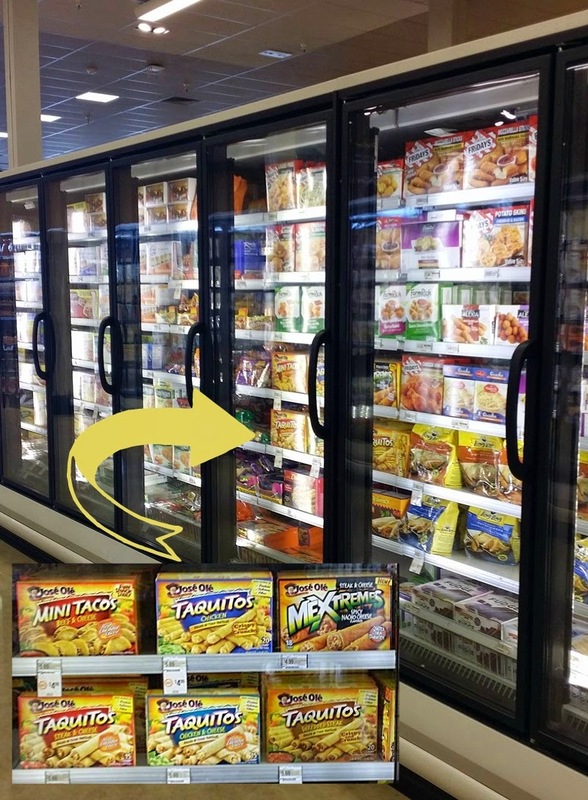 The store is brand spanking new, so they don't have all of their signage up yet, but they were super easy to find in the snack area of their frozen food department. I have also found José Olé at my local QFC, Albertson's, and Fred Myers. So no matter where you live there is a store nearby that will carry your favorite José Olé snacks. Would you like an opportunity to win prizes worth over $700? Of course you would! Head on over and RSVP for the #FlavorYourFiesta Twitter Party on May 5, 1-2 pm EST, and you will get the chance. Get your $2 off coupon here and make sure to follow José Olé on Twitter. So, what José Olé snacks will you serve for your Cinco de Mayo celebration? You know these Shredded Steak Taquitos are my fave. I would love to hear what yours is! Now this really made me feel so hungry!!!! Looks amazingly delicious. Superb! Chicken taquitos are my favorite! Greetings from San Diego! Yes yes!! :) I love chicken flautas (in flour tortillas)! I sneak a bit of cream cheese inside to make them ! super creamy/cheesy YUM! !